Rare amphibians living on rocky plateaux in western India are in desperate need of greater protection as their habitats are being eroded by expansions in population, industry and tourism, new research has shown. An international team of scientists studied 21 species living in the northern section of the Western Ghats Biodiversity Hotspot, designated one of the eight most important global hotspots and one of the three most threatened by population growth. They examined amphibian distribution and their essential habitats on rocky plateaux at a range of altitudes and found several areas where habitats were being destroyed by human activity such as mining, wind turbine installation and tourism. The amphibians in the region are also at risk from the spread of diseases including the potentially lethal chytrid fungus. As a result, some species were already considered endangered with one – the Amboli Toad (Xanthophryne tigerina) – labelled critically endangered on the International Union for Conservation of Nature’s (IUCN) Red List. Others are listed as data deficient as researchers don’t yet have enough information to say if their populations are at risk. For many of the species the research, led by the University of Plymouth and published in the scientific journal PLoS ONE, represents the first statistically supported assessment of their habitat requirements. It also calls for greater efforts to make people aware of the threats posed by development and industry, and for an increased focus on preserving the plateaux, their microhabitats and the species that live in them. The Western Ghats is a chain of hills that runs north-south for around 1,600km along the southwestern coast of India, close to cities including Mumbai, Pune, Goa and Bangalore. Part has been declared a UNESCO World Heritage Site including one of the northern rocky plateaux. This research focused on 14 sites within the area’s northern section, which is considered geologically distinct and biologically isolated with many species endemic to the region and even to individual plateaux. It showed that within the plateaux there were microhabitats such as rocks, pools, and woody plants which are all essential to the amphibians’ chance of survival. However, in areas where these habitats had been eroded away, for example by the removal of rocks for development, some amphibians were less abundant. Some sites are being completely lost to open cast mining. 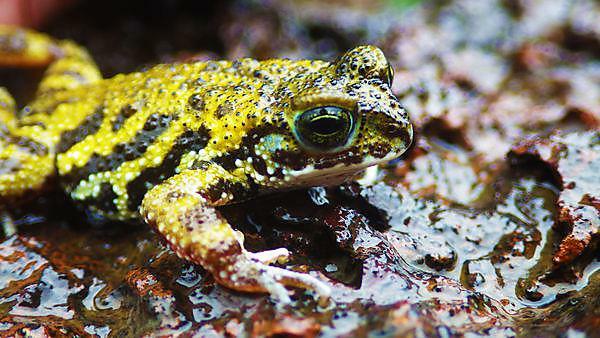 The researchers say that as the first statistically supported study looking at amphibian populations in the northern section of the Western Ghats, the work has added substantially to known microhabitat associations and shown that their preservation is clearly important for future conservation. The full study – Micro-habitat distribution drives patch quality for sub-tropical rocky plateau amphibians in the northern Western Ghats, India by Thorpe et al – is published in PLoS ONE, doi: 10.1371/journal.pone.0194810. Scientists taking part in the study were supported by The Royal Geographical Society, Zoological Society of London and the Percy Sladen Memorial Trust. A critically endangered species on the IUCN’s Red List, the Amboli Toad (Xanthophryne tigerina) is particularly reliant on the large loose rocks found on rocky plateaux within the Western Ghats. They shelter beneath them to avoid predators and drying out then, during the mating season, adult males climb onto rocks to call for mates with the females laying their spawn in micropools formed on them. Once hatched, young tadpoles feed on biological material which is found on the rocks, surviving there until they are of a size when they can move on. Find out more about careers in conservation biology. Gain the skills to work in conservation biology, consultancy and research.